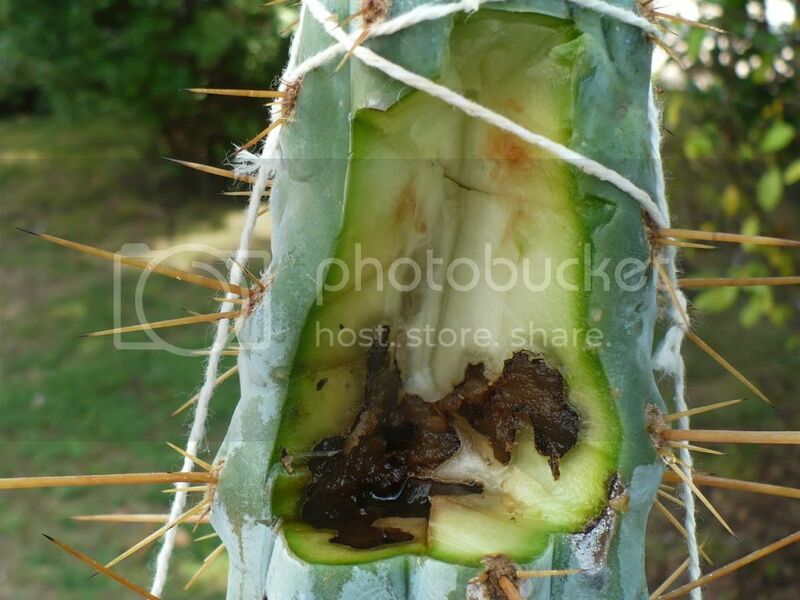 Sick Cactus with Black Spots that are not mushy. My cactus has black spots, but they are HARD, not mushy like rot. One of them also has this powdery white coating that also appears in other places, but not so thick. The white area to the left is actually black underneath. 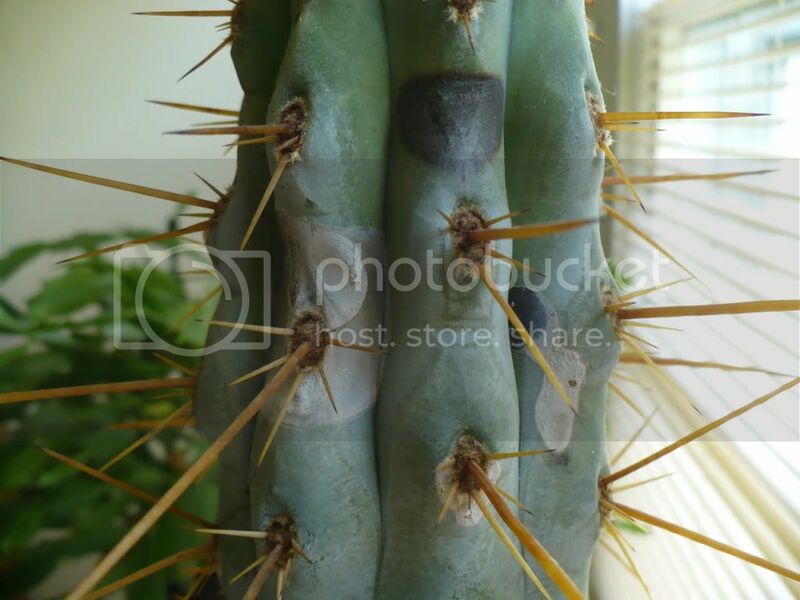 The cactus flesh is indented where the spots are. The cactus is also "bending" slightly toward the spots at the affected area. We re-potted the plant about a month ago with new purchased soil mixed for cacti. 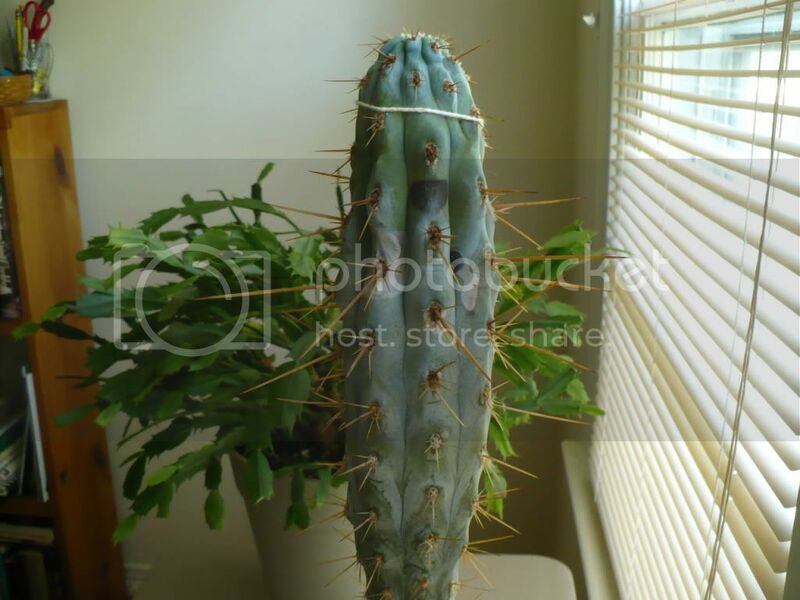 Also, this is a single stalk cactus; there are no stems that can be harvested/rooted/etc. in order to save the plant. Weird as it sounds, it still sounds like rot. Especially when you say it is starting to lean. I honestly haven't seen anything like that before. Hopefully someone with more experience will come on and answer your question. Good luck with it. Well, exploratory surgery revealed the diagnosis: Rot. Images show the extent of damage: the initial exposure, and the finished procedure. I really hated to do this, but I'm glad I did. Maybe "Spike" will survive, and I hope this helps someone else. WOW ---------Poor SPIKE -------that's incredible, that you cut that all out like that. Spike looks like a trussed turkey---- Poor thing. That really is amazing, that it covered over and went black like that. I really have never seen anything like that at all. I sure do hope that Spike lives, after all that surgery. Let us know how he does, ok Good Luck.